By emily on June 1st, 2009 . Filed under: Accessories, Kitchen . Eco-friendly sandwich size reusble bag. Each reusable snack and sandwich bag can replace hundreds of plastic bags in it’s lifetime. So if you think about it these bag really help the earth by reducing waste. The exterior of the bag is a 100% novelty cotton print. The interior (lining) of the bag is a 100% waterproof PUL fabric (commonly used when diaper making) which is safe to use with food and snack as it is NOT made from vinyl. The bag has velcro closer across entire top to ensure your snacks don’t fall out. The outter cotton print has already been preshrunk so the bag will not shrink when washed. 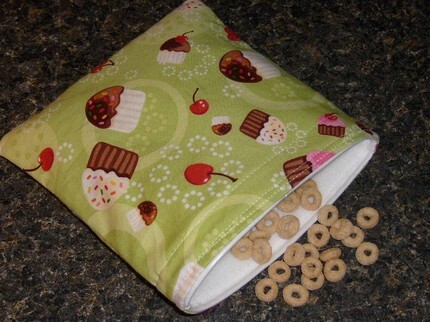 This bag is great because it can be turned inside out and wiped OR you can just throw it into the washer and line dry if you get stick PB&J on it!